Aunt Goodiebags - Aunt Goodiebags! Check out our NEW HyperDuino-MakerBit Mini Bookshelf! You can read the books online. The LIBRARY was made using Book Creator. CLICK HERE to go to the shelf. 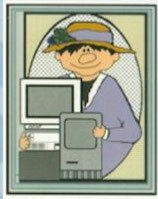 Aunt Goodiebags is a character that lives in the computers of Dr. Nancy Smith. to help teachers better understand technology and how it could be used to enhance their teaching. we know technology can be a tad confusing and frustrating. We also know that choco-chip cookies can help! Please look around at the items on the navigation bar at the top of the page. There are lots of things to look at and ideas to try. Yes, our HyperDuino Ideas book IS now available online at Barnes and Noble and Amazon!!! 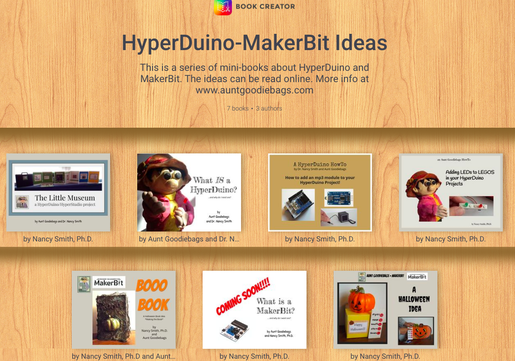 Search those sites for "HyperDuino" in "Books"
Hope you have some time to look around the site! Leave me a note (at the bottom of this page... or send me an email if you have any questions or comments). Please send a note if you have any questions or comments!